According to 6Wresearch, Europe Blockchain Technology Market is expected to grow at a CAGR of 52.4% during 2018-24. Blockchain technology is getting widely accepted among European countries owing to increasing government initiatives planned to improve the technology coupled with surging demand for secured database. These factors have buoyed the overall growth in blockchain technology market of Europe. Blockchain technology is further anticipated to register high growth on account of potential benefits including transparency, immutability, and security from cyber-attacks which acts as an alternative to traditional financial solutions over the coming years. According to 6Wresearch, Europe Blockchain Technology market is projected to grow at a CAGR of 52.4% during 2018-24. The market registered a healthy growth in revenues during 2014-17, attributed to surge in demand from end users such as BFSI, government, public sector and real estate segments. BFSI industry has seen a shift from centralized infrastructure to decentralized distributed ledger ecosystem. Even real estate segment has inclined towards blockchain technology as blockchain constantly records and shares information which makes the process less time consuming and reduces the risk of frauds. In Europe, Switzerland holds majority of the market share in terms of revenues due to establishment of crypto valley and development of various blockchain projects in the country. Malta also contributed significantly to the overall blockchain technology and is anticipated to register healthy growth during the forecast period owing to relocation of few big company offices to Malta. Some of the key players in Europe blockchain technology market include- IBM, R3, Intellectsoft, Limechain, Bitfury, N-iX, Digital Asset holdings and Microsoft. The report thoroughly covers the Europe Blockchain Technology Market by technology type, applications, end user, and countries. The report also provides an unbiased and detailed analysis of the on-going trends, opportunities/high growth areas and market drivers which would help the stakeholders to device and align market strategies according to the current and future market dynamics. • Historical Data & Forecast of United Kingdom Blockchain Technology Market for the Period 2016-2024F. • Historical Data & Forecast of Switzerland Blockchain Technology Market for the Period 2016-2024F. • Historical Data & Forecast of Netherland Blockchain Technology Market for the Period 2016-2024F. • Historical Data & Forecast of Germany Blockchain Technology Market for the Period 2016-2024F. • Historical Data & Forecast of Malta Blockchain Technology Market for the Period 2016-2024F. • Historical Data & Forecast of Nordic Countries Blockchain Technology Market for the Period 2016-2024F. 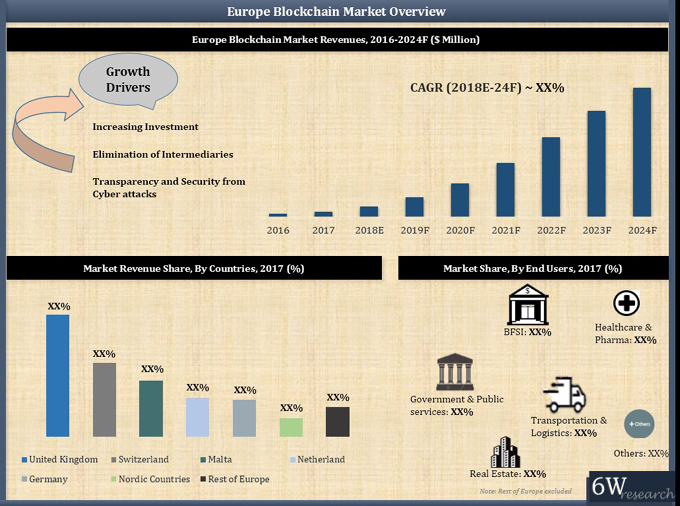 • Historical Data & Forecast of Rest of Europe Blockchain Technology Market for the Period 2016-2024F. 7 Switzerland Blockchain Technology Market Overview. 7.1 Switzerland Blockchain Technology Market Revenues (2016-2024F).